Lilac fairies to dancing candy canes, swan princesses, princes, and dancing mermaids, your child will dance their dreams in our ballet camps. Nine, week-long, themed camps, each week featuring a different fairy tale favorite. Daily ballet lessons, choreography, and prop making are all part of the magic. Your little dancer will believe (s) he is a real ballerina or ballerino! Perfect summer camp for boys and girls, 3-12 years. Morning Half Day (9:00 am – 12:00 pm). Lunch hour care (12:00 pm – 1:00 pm) can be added. Before (8:00 am – 9:00 am) and after (4:00 pm – 6:00 pm) camp care also available. The YWCA Princeton is located at 59 Paul Robeson Place in Princeton and is easily accessible from Route 1 North/South or Route 206 North/South. The Summer Ballet Program meets in the Dance Studio located in the Program Building. Parents/guardians should park their car in a parking spot in the lot (never alongside the curb) and walk their child in to the building each morning at 9 am. Being on time is very important as we start the morning off with our first ballet lesson from 9-10 am. Parents/guardians must sign their child in and out each day when they are dropping them off and picking them up. Dancers should come dressed in a short-sleeved leotard and sneakers or close-toes shoes (no flip-flops) and bring ballet slippers to change into. Ballet tights are not recommended in summer, so please don’t send your child dressed in tights, it’s too hot. Hair must be neatly up and off the child’s face. The YWCA will provide snacks for the children once a day for half-day campers and twice a day for full day campers. Snacks will consist of a fruit or veggie option, a cracker/cookie option and a water/juice option. If your child has an allergy and you would like to provide us with your own snacks, that is acceptable and we will keep your child’s snack separate and safe for the week. Friday is fun day and we will ice pops in the afternoon. If your child is staying for lunch hour or is a full day camper parents are to provide lunch each day for their child. We do not have refrigeration for lunch boxes so please make sure that you include an ice pack in all lunch boxes. In consideration of the many food allergies children have today, the YWCA appreciates your cooperation with the elimination of any food products that contain nut or nut products from our camp. Ballet Performances are every Friday at 3:30 pm and dismissal is at 4 pm (after the performance). All ballet camp children will stay for a full day of ballet camp on Friday to rehearse and perform. Even half day campers are encouraged to stay for the whole day on Fridays so that they can participate in the weekly performances. Parents/Guardians, please plan to attend the performances. 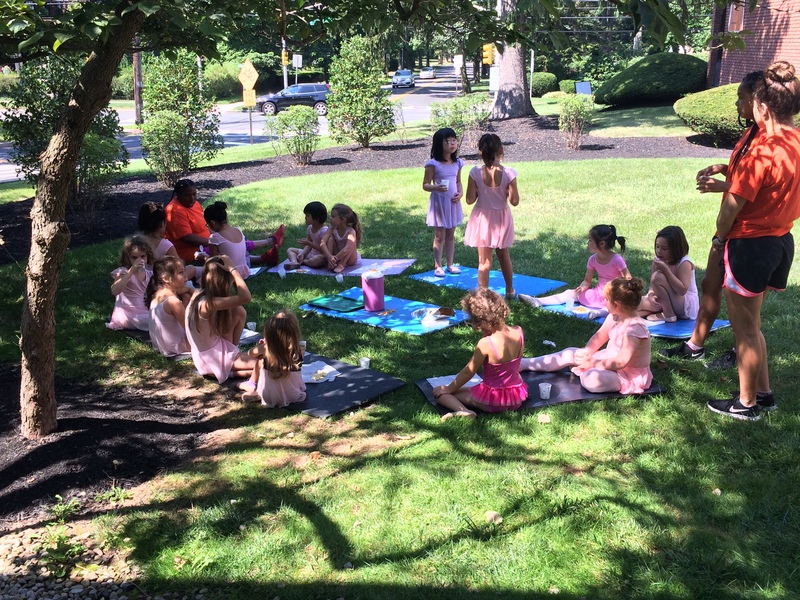 Afternoon ballet camp children will participate in walking field trips to HALO PUB for ice cream. When you register online, please indicate your authorization using the walking permission release. The YWCA Princeton Summer Camp Staff is comprised of a strong, experienced group that enjoy working with young children. The staff includes experienced adult counselors and enthusiastic assistant counselors. All staff members must go through extensive training prior to the start of camp and are committed to ensuring that your child has a safe, healthy and happy camp experience. Each day, after care is available from 4-6 pm. This can be added to your registration at time of enrollment. NJ State mandates current immunization form for each child entering summer camps. Please have your Immunization Form with you to upload during the online registration process. *The rates for the week of July 4th are prorated.